Help support our worldwide amphibian conservation efforts and gain access to a large and growing library of educational resources. Amphibian populations are rapidly disappearing around the world...but you can help! 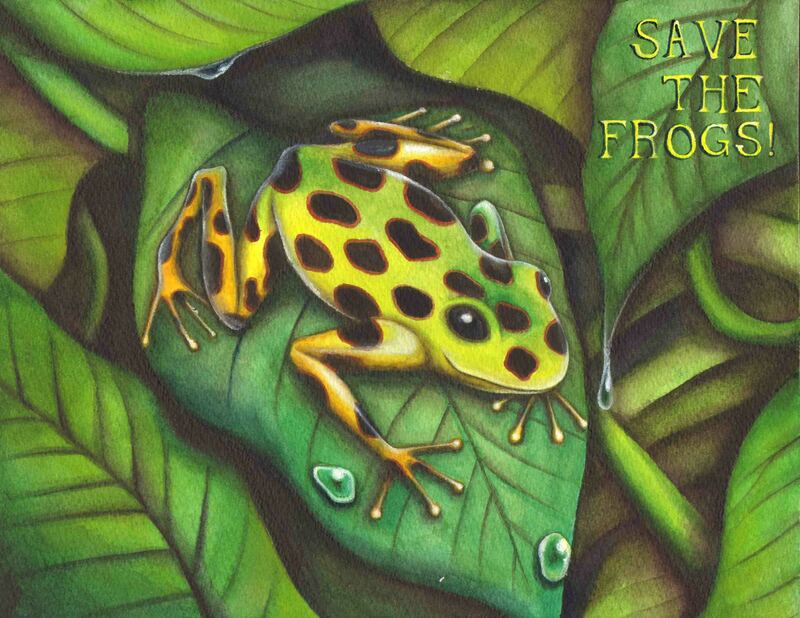 Since 2008, SAVE THE FROGS! has been at the forefront of the world's amphibian conservation movement, leading educational events and environmental campaigns in at least 57 countries. Our numerous successes are a direct result of the passion and dedication of our staff, volunteers, donors and members. When you join SAVE THE FROGS!, you become empowered to better protect amphibians, achieve your environmental goals, make the planet a better place for humans and wildlife, and ultimately take an active role in saving frogs from extinction. Grants you access to the SAVE THE FROGS! Membership Site, which holds a large and growing archive of educational resources not available elsewhere. The site's resources are well-organized and allow you to track your progress so you know exactly which courses and lessons you have completed, and which remain. Provides a scholarship to a frog conservationist with financial needs, so that they too can be a SAVE THE FROGS! member and assist amphibians in their part of the world. SAVE THE FROGS! scholarship recipients undergo an application process and periodic assessments to ensure they are active participants in the SAVE THE FROGS! community and making use of their scholarship benefits. Allows you to access the SAVE THE FROGS! World Summit, a monthly online event that brings together community members and guest presenters for discussions and presentations on current events in the world of amphibian conservation. Allows you to access the monthly SAVE THE FROGS! Members Meeting, an online event at which you can ask SAVE THE FROGS! Founder Dr. Kerry Kriger your questions about amphibian conservation, environmental careers or anything else on your mind that is relevant to SAVE THE FROGS! or the environment. You will also get updates related to our current projects and campaigns. Enables you to better connect with the worldwide SAVE THE FROGS! community. Receive discounts on a variety of SAVE THE FROGS! offerings. Receive advanced notice of SAVE THE FROGS! workshops, ecotours and other events. Receive an invitation to the annual SAVE THE FROGS! Members Hike, a free event at which members get together to explore the natural world, look for amphibians and connect with other frog savers. "I just went ahead and renewed my membership to STF. It was the least I could do with what you have provided me throughout the past few years. From flyers and pamphlets for my STF programs; powerpoint slides for my classes in college; to the inspiration that has helped me to attain a job in the field of herpetology -- I can't thank you and the rest of Save The Frogs enough for all you do." Frog art from China by Ho Yu Yan, participant in the SAVE THE FROGS! 2012 Art Contest. Join SAVE THE FROGS! today. Choose to pay monthly or get three months free when you pay annually. To take advantage of this 50% discount, please visit the Membership Discounts page. If you are a dedicated amphibian enthusiast in need of full financial assistance, please visit the SAVE THE FROGS! Scholarships page. I am very excited to be a member of Save The Frogs. I am a 4th grader in Arizona. We don't have many true frogs out here but during the monsoons in July and August, I love going out into the desert with my dad and brothers to catch Couch's Spadefoots and Colorado River Toads. I'm very grateful for the work you and your organization do. Frogs and toads are amazing creatures and I'm glad to be a member to help save them and give their species a better future! 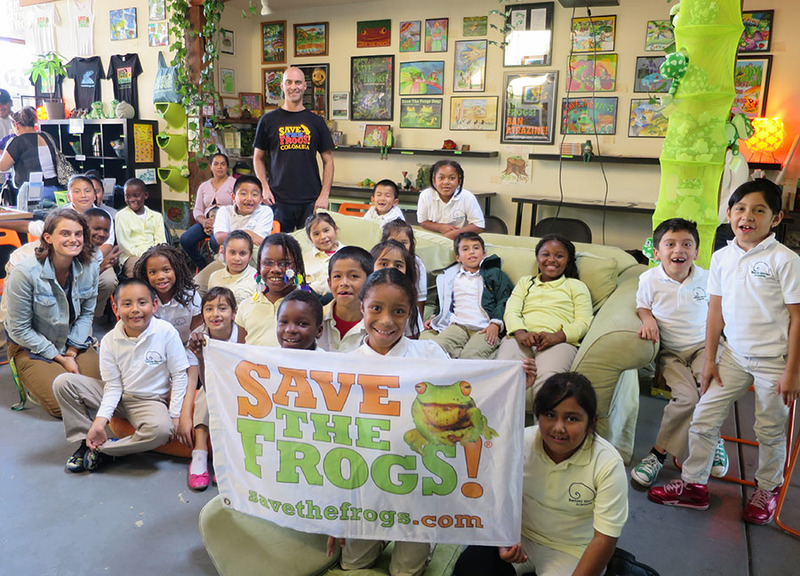 Students from the Maynard School in Berkeley, CA enjoying a field trip to the SAVE THE FROGS! Education Center in 2014. (1) Frogs are the most rapidly disappearing animals on the planet. (2) Nobody does more to help frog populations than SAVE THE FROGS! (3) You understand that our programs cost real money, and you care enough about the future of our planet to chip in. (4) Your children and grandchildren will thank you for helping SAVE THE FROGS! (5) You get awesome membership benefits! Saving frogs is good for wildlife, ecosystems and the greater community. Saving frogs stimulates creativity, generosity, and service to others, all of which are linked to improved health and happiness. And when you save frogs you get to spend time with amazing amphibians and interesting, dedicated frog lovers. As such we encourage you to increase your frog-saving efforts and challenge you to step up your efforts on behalf of frogs and the planet! "Frogs played a big role in my childhood. I loved to hear them, see them and throw myself into muddy ponds to catch them. I always released them. Frogs were everywhere and now they are not. This saddens me greatly and I would like to be part of a group that is trying to reverse this." — Tammy Taylor, Masters Degree in Education from Harvard, School teacher for almost 30 years. The SAVE THE FROGS! Membership Site was created by Dr. Kerry Kriger, who has been saving frogs and spreading amphibian awareness since 2003. In 2003 I flew to Australia and spent four years there researching frog extinctions and learning everything I could about frogs and how to save them. I returned to the USA and in 2008 started SAVE THE FROGS! because there was no nonprofit organization dedicated exclusively to amphibians and very little was getting done to educate the public about amphibians, protect critical habitat or enact necessary legislation. Frogs make the world a brighter and more interesting place to live. Kids love frogs and they will be extremely disappointed if frogs continue to go extinct due to their parents' apathy and inaction. Amphibians cannot save themselves. Our governments are ineffective at preventing amphibian extinctions. Our chance to save frogs is today. The time to act is now. Do you want more wetlands destroyed? More rainforests chopped down? More kids graduating college without ever having learned a single thing about frog conservation? I don't either, and that's why I'm urging you to take action for amphibians before it's too late: join SAVE THE FROGS! today and be part of a worldwide movement to protect amphibians and make a better planet for both wildlife and people. SAVE THE FROGS! is a global community of amphibian conservationists. The SAVE THE FROGS! movement transcends cultural and geographical boundaries, and educates, inspires and empowers frog enthusiasts worldwide to make extraordinary contributions to the betterment of the planet. We look forward to having you as a member! "I really admire your work and me signing up for monthly donations was a long overdue thing on my list! Keep up the fantastic work and take care." If you need to cancel for any reason, you cancel directly from your membership dashboard when you are signed into the site. Or you can simply email us at contact@savethefrogs.com and we will ensure that no further charges to your card occur. You will still be able to access the site for the duration of time covered by your last payment. "We need to do something as a species to save these incredible and vital creatures. Thank you for everything that you and your team are doing." We are positive that you will love your SAVE THE FROGS! membership, so we have created our SAVE THE FROGS! Guarantee to reflect that. If you are unsatisfied with your membership for any reason and you would like your last payment refunded, simply email us at contact@savethefrogs.com requesting we cancel your membership and refund your last payment, and provide a reason or two for your dissatisfaction. Monthly payments will be refunded in full at any point in the month. Annual membership payments will be refunded in full any time within 60 days of having placed your payment. After 60 days, you will be refunded the amount of unused membership (e.g. if you are 9 months into your membership we would refund you 3/12 of your annual payment). "Kerry you can count on me to continue renewing, I believe in you and what you are doing for Earth!" The satisfaction of knowing you are financially supporting important amphibian conservation projects worldwide. Access to a large and growing library of educational resources, including videos and downloadable PDFs. Access to the monthly SAVE THE FROGS! World Summit, an online event featuring presentations by amphibian conservation experts. Access to the monthly SAVE THE FROGS! Q & A series with Dr. Kerry Kriger, so you can get your questions answered and receive advice on all things environmental. The satisfaction of knowing that your membership supports a full scholarship for one frog conservationist with financial needs, so that they can receive a SAVE THE FROGS! membership and therefore better assist amphibians in their part of the world. An invite to the annual SAVE THE FROGS! Members Hike, a fun, free event in which we enjoy the outdoors and search for our amphibious friends. Email us at contact@savethefrogs.com and we will get back to you as soon as possible. Thanks for your interest in SAVE THE FROGS! "I love my membership! Please, please, become a member and help save some frogs and toads! Every member counts!"